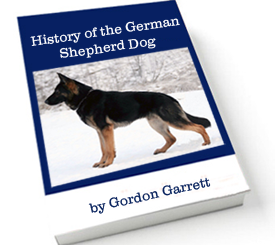 The following is a very brief history of the German Shepherd Dog. The breed was originally derived from a conglomeration of the old breeds of herding and farm dogs that have been associated for centuries with man. These dogs had served in various capacities, from servant and companion to shepherds and watch dogs. Sponsored by theVerein fur Deutsche Schaferhunde, the parent club of the breed founded in 1899 in Germany, the enthusiasm of the German Shepherd spread rapidly from about 1914 onward and extended to many different parts of the world. Interest in the breed since then as spread by specialty clubs in many countries, just as it has been in the United States by the German Shepherd Dog Club of America. These qualities, which have endeared the German Shepherd Dog to a wide public in practically every country of the globe, are those of the companion, protector, and friend. The German Shepherd is not a brawler, but a bold and punishing fighter if necessary. In his relation to man he does not give affection lightly. He has plenty of dignity and some suspicion of strangers, but his friendship, once given, is given for life. On the physical side, the German Shepherd Dog has been developed to a point of almost ideal fitness for the work he is called upon to do. He is a dog of middle to larger size with enough weight to be effective as herder or patrolman, but not enough to be cumbersome or unwieldy. The impression of the dog as a whole is one of ruggedness combined with nobility, of power combined with agility. There should be a sense of balance, forequarters and hindquarters compensating each other in their development. The outline should be smooth and flowing, and the topline of the dog, from the ear to the tip of the full tail, a single sweeping succession of unbroken curves. The German Shepherd Dog is a natural dog, unchanged for any whim of the show ring. Over the years however, the German Shepherd Dog has become subject to intensive development with essentially two specific distinctions in todays modern world, the show line and the working line. The show line is characterized by a less “energetic” version whereas the working line is characterized by more “drive”.